MAKE CLAMPS FROM ORDINARY WIRE EVEN A COAT HANGER! ClampTite tool is is the only tool on the market designed to tighten safety wire - any size, any shape, anywhere, thus utilizing it's strenght and versatility. 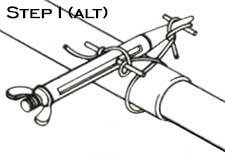 The tool provides a way of tightening wires wrapped around an object and then locking it in place.It can be used with various sizes of wires, which eliminates space as well as strength issues, oftened encountered with screw operated worm gear type clamps.ClampTite quickly replaces ineffective or damaged conventional hose clamps with a temporary or permanent clamping mechanism formed from stainless steel safety wire. Insert end of wire into front pin on the left hand side. Bring wire over the nose and in front of forward pin on the right hand side. Wrap wire around hose (as many wraps as desired). 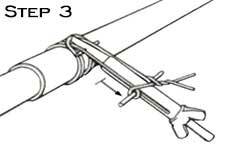 Bring wire over the top of the wraps and around the rear pin on the right hand side. 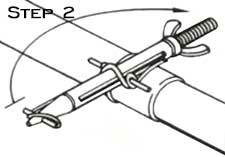 Take wire over the top of the tool and around the pin on the left hand side. Place loop of wire around nose and twist to tighten. Wrap wire around hose (as many wraps as desired). Bring wire over the top of the wraps and around the rear pin on the right hand side. 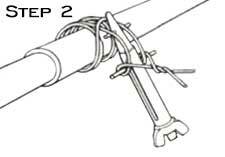 Take wire over the top of the tool and around the pin on the left hand side. Turn wing nut to tighten. When clamp has reached desired tension, rotate tool 180 degrees to lock clamp. Loosen wing nut and remove clamptite tool. Clip wire ends about 1/4 inch from clam and push down towards hose. Cut wire to length (4 times around project plus 12" for tool). 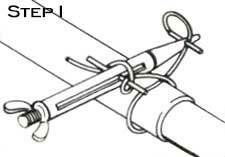 Fold wire in half, tape or wire nut ends together. Wrap around hose where you want a clamp. Tuck ends through the loop. Continue to wrap around. Place tool as shown with wire over front pin and around rear pin. 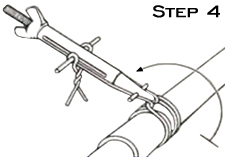 Twist ends together tightly about 6 twists as close to the body of the tool as possible. 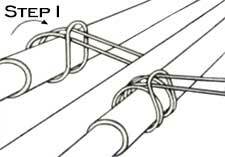 Place notch at end of tool against the wire loop. Turn wing nut clockwise to tighten (right hand threads). Rotate tool over to lock the clamp bending wires back over themselves. Loosen wing nut and remove the clamptite tool. Clip off wire ends about 1/4 inch from clamp and push ends down against the hose. 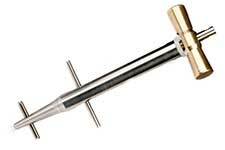 How to use the ClampTite Tool is explained in this instructional video. 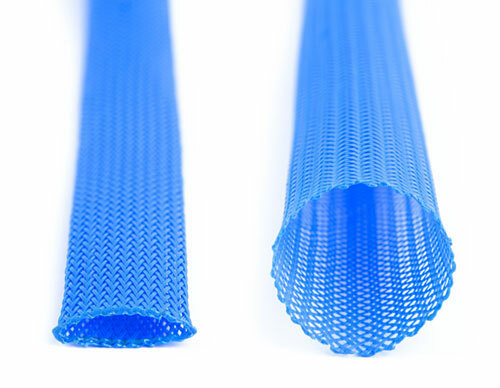 More instructional videos for our various products can be found on Wirecare.com's Page.